The bed is the centerpiece to our bedroom and there are essential pieces of furniture within it. Beds give us a place to relax and snuggle up and most importantly, provide us with a place to sleep and restore energy. Our bed can have significant impacts on all the things that are important to us – fitness, mood, relationships, energy, productivity and recreation. The way we set up our room can affect how well we fall asleep. We want to create an environment that allows us to get enough sleep to keep our physical, mental, and emotional health in check. For proper usage and full optimization of the bedroom, the layout & ergonomics play an important role in it. Also Read: Bedroom Types with Bedroom Furniture! Only Ergonomic Offices? Why not an Ergonomic Bed? The term ‘ergonomics’ is derived from the Greek words ‘ergo’ and ‘nomos’, meaning natural laws of work. It is the art of designing products to suit people and their lifestyles, focusing on improving our interaction with everyday products. These principles are applied to various places. Here we will discuss that place where we spend a third of our lives – our bed. Taking ergonomic(user-friendly design) principles into consideration is just as important in the home as it is in the workplace. An ergonomic bed works according to the body shape and size. They are designed keeping flexibility in mind. An ergonomic(user-friendly design) bed allows you to adjust the bed’s shoulder zone, waist zone and hip zone, to support your entire body during sleep. This result in better sleep and fewer pains leading to a peaceful and happy mood during the day. Typical flat mattresses look and feel good when we test them for a few moments in a showroom; however they can have a negative impact on our health when we sleep on them night after night. Our bodies are heavier at waist and lighter at hips and shoulders. The weight of our mid-body area often causes mattresses to sag in the middle. This puts unwanted stress on our spine and provides restless sleep which can often lead to back pains. The breakthrough of a bed with ergonomic support solves these issues to give us comfort to ensure us best night’s sleep. Most conventional mattresses currently on the market have to remain changed substantially since the 1960s. Most of us are sleeping on beds that are not up-to-date or in line with what we know about the human body and sleep. Sleeping on a flat uniform mattress can put our spine into an unsupported and unnatural position which is why an ergonomic bed is the new emerging trend. We have ergonomics at work, in our car seats, etc., so why not in our beds? Having zero stress on our bodies while we sleep can enhance our sleep and wellbeing. To ensure quality sleep the bed must have the right dimensions, a perfect base and quality mattress made from appropriate material. Double size beds are available in dimensions 160 cm (63”)/180 cm (71”)/200 cm (79”) x 200 cm (79”) and 200 cm (79”) x 220 cm (86”). Single size beds are available in dimensions 80 cm (32”)/90 cm (35”)/140 cm (55”) x 200 cm (78”) with bed frame in varnish, veneer or any other suitable materials. The type of bed we need will depend on many different factors. If we are on a tight budget, we might decide to look for lower cost options rather than finding one that we fall in love with. We will also need to consider our decor style, room requirements and space in the bedroom. Interior designers have developed the version of the Golden Ratio(1:1.45), known as the 60-30-10 rule. It’s often used when painting a room, in which 60% of a room would be a dominant color, 30% of secondary color and 10% an accent color. Concerning a room’s space applying this rule, 60% of the room would be furniture, 30% walking space and 10% for miscellaneous bits and bobs. 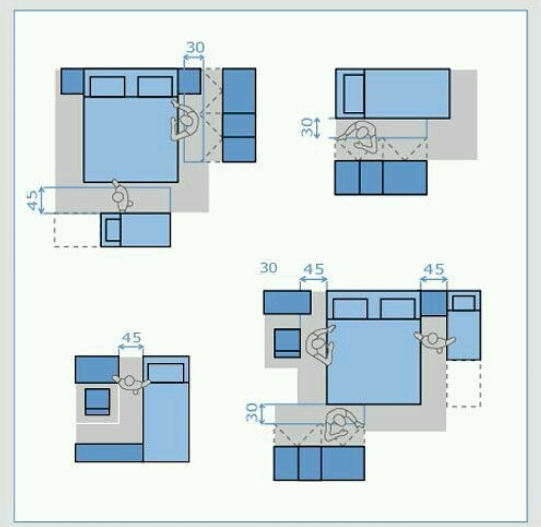 By taking the bed into account, with that 60%, we should be able to create a balanced bedroom. So, there we go. 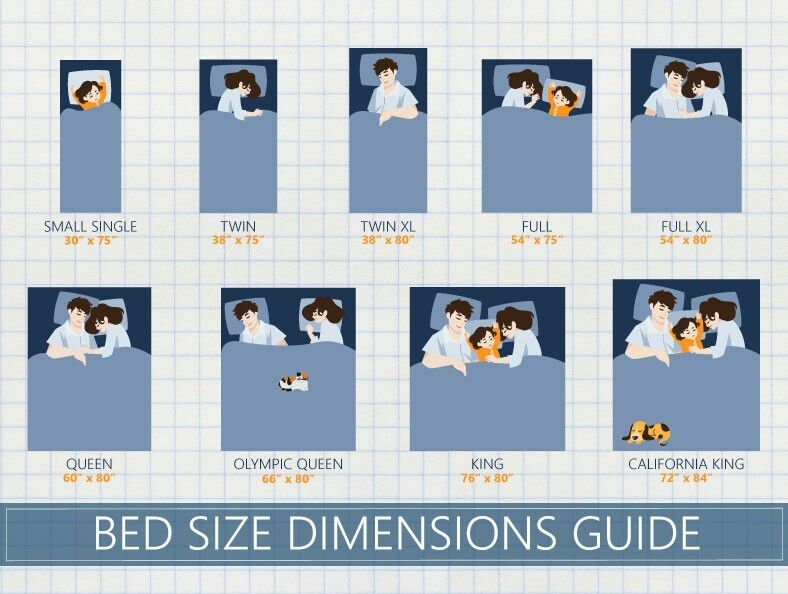 If we’re looking at the dimensions of an average room, then 3:1 looks to be the optimum bedroom-to-bed ratio, while an amended Golden Ratio of 1:1.45 can also produce some interesting results. The bed should be at a suitable height to enable you to get on and off quickly without straining the back. The mattress should be soft & firm, not hard. As a general rule, lighter people need a softer mattress while heavier people need firmer ones. Importantly, the mattress should be even, i.e. it shouldn’t have any unevenness & damage and should be replaced when worn out. Synthetic mattresses are readily available in the market and are more durable than the old cotton mattresses. It’s essential that pillows should be of the right proportion, not too high and not too thin. While sleeping on the back or side, the pillow should sufficiently support the neck to avoid straining it and follow the natural curve of the spine. A cushion, smaller in size, placed below the knees can reduce strain when sleeping on the back. For people who mostly sleep on their tummy, the pillow should be thin for a comfortable sleep. Pillows lose their elasticity after a few years and should be replaced periodically as and when required. In present days, if the scale of the project is large and have sufficient space, the client usually prefers to have walk-in wardrobe or closet hence giving more usable space in bedroom. Where the space is less, the wardrobe is generally placed in bedroom. The layout of the wardrobe should be placed in such a way that the wardrobe fits on the long wall of the bedroom usually near the attached toilet. If you have a dressing table with a full length mirror, it is good if it is placed on the side of the bed. It is recommended not to place it in front of the bed. The side table should be close to the bed. This allows a person to easily reach for the materials needed without stretching too much. If we have a digital clock, make sure to cover the light as it can interfere with sleep. Ideally, placing a television in the bedroom is not recommended, as watching rapidly moving pixels is not suitable for rest. But if you have one, place it at a suitable height so that the neck and back are not strained while viewing it. Above given were some of the design tips and tricks for the bedroom. Do follow it in order to make your place a user-friendly bedroom. Previous PostPrevious What is the Structural Analysis? Next PostNext 10+ Stunning DIY Vase Ideas For Your Home Decor!